Oh man, where do I even begin? A friend of mine mentioned this festival to me last year. I believe this is the second year that they've had the festival in the greater San Luis Obispo, CA area. Last year it was located in Paso Robles, and this year, to my sheer delight, it was held in Avila Beach! Avila just happens to be one of my favorite beaches ever, so it was an easy decision to buy a ticket to this year's festivities. They have plenty of festivals all over the country, however, so if you are interested and don't live in California, rest assured that there is probably a festival located not too far away. The other great part of this event? Ticket sales benefit the Children's Miracle Network Hospitals, dedicated to providing pediatric healthcare and research. Makes the approximately $60 ticket price a little more understandable. My friend and I arrived early to hit the beach across the street from the festival venue before the 2pm opening. The weather was awesome! 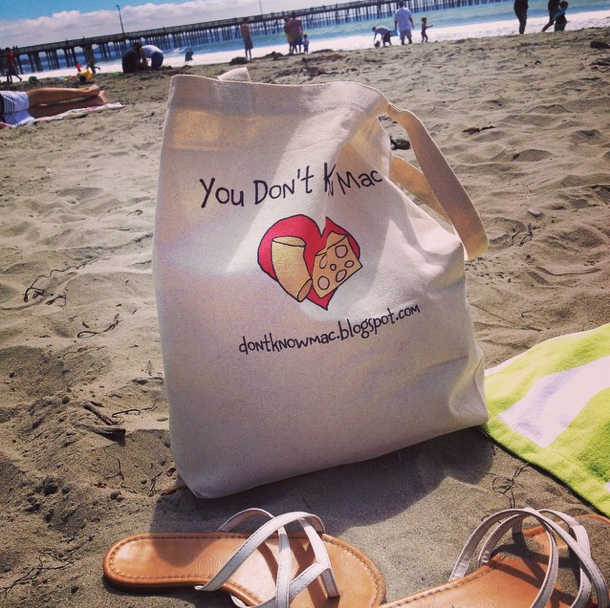 We even brought along our "You Don't Know Mac" tote bags. They looked pretty awesome on the sand! 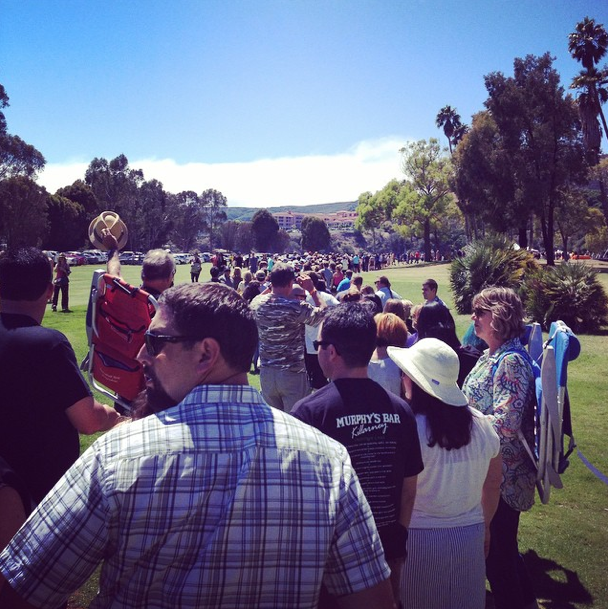 Then, just before 2pm we began walking over to the festival entrance and there was already a crazy line! There were hundreds of people waiting to get in. Everyone got a wristband and had their bags and IDs checked (no one 21 or younger allowed due to alcohol). Were handed an etched wine glass and a plastic plate with some plastic utensils and then we were left to fend for ourselves amongst many other hungry mac and cheese lovers. As we walked in, the first thing I felt was overwhelmed. There were tents and booths everywhere! It was hard to know where to start. It seemed that lines for each booth had just sprung up out of nowhere. So my friend and I hit one of the first open booths with a shorter wait, which ended up being a winery (there were also free wine and some beer tastings at the event). Then we hopped in the next line, which was much longer, to get our first bite of festival mac and cheese. After that, it was a whole lot more hopping around and waiting in lines. SLO Brew offered a couple options, one with tri-tip and one vegetarian. They used Bleu cheese with accents of caramelized onions. The onion flavor was a bit strong and the sauce wasn't very creamy. I enjoyed the tri-tip version best, and I was impressed that the meat flavor didn't totally overpower the cheese. They also added a small amount of breadcrumbs on top. Sea Venture offered one of the three deep fried varieties at the event. Theirs included lobster filet bites, 5 cheeses (including American and mozzarella), and some sneaky onion pieces. My particular piece was a little too lobster-y, but my friend liked hers. I tried a bite, and it seemed a lot more reasonable. I suppose it just depends on which piece you happen to end up with. I didn't actually end up finishing my piece because it was so full of onion and lobster I could barely taste any cheese. By far the most interesting and original dish at the festival, Spike's Pub went the vegan route, making their entry with green chiles and using beer instead of cheese sauce. I'm not sure how they added the beer flavoring exactly, but it ended up tasting more like a light pasta than a mac and cheese. It was an interesting idea, however, and the flavor was good for whatever it was. But it was not mac and cheese. This ended up getting my vote. McPhee's entry included flavors of pork, chicken and shrimp, and somehow it all blended together really well. At one point my friend yelled out, "It's a gumbo!" It also had a really good creamy texture which I'm particularly fond of in my mac and cheese. Apple Farm decided to use goat's milk, which, unfortunately, I don't think worked in their favor. I haven't met too many people who are fond of goat's milk in their mac and cheese. I had a hard time judging it. It had great consistency, but I just wasn't a fan of the mixture of goat's milk, pancetta and asparagus. One of the other deep fried varieties I tried while at the festival, Paso Catering Co. took it up a notch by including a chipotle aioli dipping sauce. It was delicious! Jeffry's Catering took a unique twist on the dish by creating the Paso Mac & Cheese steak dish. I had a chance to ask the chef how he came up with the recipe. He explained that he had spent a lot of time on the East Coast and ate Philly cheese steak every day. He wanted to find a way to incorporate that into his recipe. When asked about why he decided to participate in the festival, he mentioned the great cause that it benefits, and also the fact that it's one of the most publicized food events in the greater San Luis Obispo area, with radio ads practically every 15 minutes. I really liked Jeffry's Mac & Cheese steak. It had great texture and the meat was really tender and flavorful. I wasn't really sure what to make of this one. All I could taste was crab. The cheese wasn't very flavorful so I couldn't quite figure out what it was. I wasn't necessarily Ventana Grill's biggest fan, but I heard other tasters loving it. Gardens of Avila was our last mac try of the day. It included ham, snap peas and parsley. It had a pretty good creaminess. I'm not usually a fan of peas, the snap peas were pretty good. I wouldn't say it was super creative. It felt a little bit like a fancy version of a typical cheddar, peas and bacon dish. I couldn't figure out what kind of cheese it was. I would have liked to have spent less time waiting in lines, but I'm not sure how you would plan the event to avoid that. It also would have been helpful if each vendor had been required to have a board listed the ingredients/flavors in their mac and cheese. Sometimes I just had to guess because they were moving so fast trying to get through the lines of people. 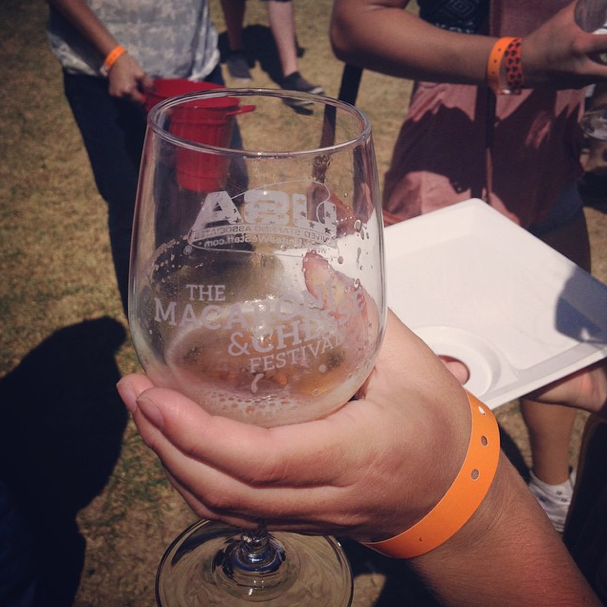 As far as the wine and beer tastings, there seemed to be a surplus of wineries. There were actually more wineries than there were mac and cheese vendors, which was a little odd. My friend wished there had been more beer tasting options. There was only one beer vendor that had free tastings. Other than that, there was another brewery selling their drinks. That was a little disappointing. Overall, I'm glad I attended the festival. It was pretty fun to see so many other mac and cheese fans all gathered in one place. Plus, it was really fun to tell all my co-workers, friends and family that I was attending a mac and cheese festival. The reactions were pretty priceless. Everything from "Wow! That's awesome, I didn't know that existed!" to "...Really?". The Mac & Cheese Festival... It's Coming!